Kids are getting exposed to coding at a pretty young age these days. From my experience with my Little One, she is pretty interested in coding and finds it pretty exciting. She likes that she can change things in an app or program on the computer. To her, that is a pretty neat thing. I am intrigued as well by coding and when I came across Bitsbox, I knew we had to check it out. If you have never heard of Bitsbox then keep on reading because it is a ton of fun and an amazing way to engage your kids in the educational world of coding. 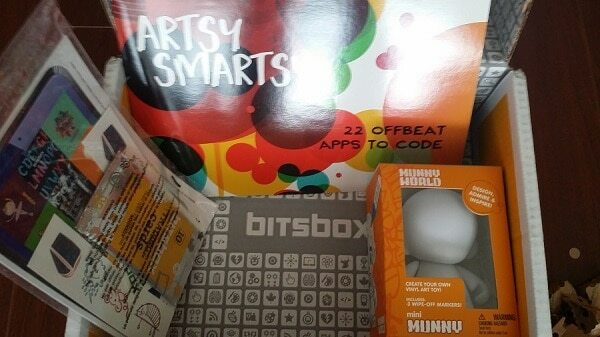 Bitsbox is a monthly subscription box full of fun and engaging coding activities and products. Bitsbox, teaches kids aged 6-12 to code with crazyfun app building projects that are printed in books, on cards, and occasionally on toys. The projects pair with the Bitsbox website where kids build real apps, with real code, for real devices. 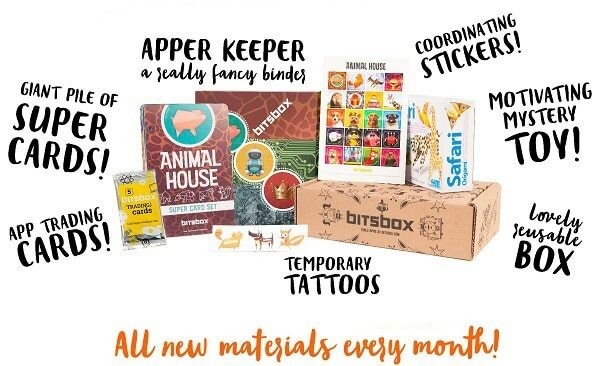 Bitsbox offers a series of subscription products in addition to a suite of one-time purchases. If you want to check out the kind of activities that your kids will be doing and just how easy learning coding can be, go give it a try here on the Bitsbox website. Did you go try it out yourself? Seriously, the best way to see how fun Bitsbox is, is to go give it a try. Grab the kids and get them making an app. Here is a video to get both you and them excited about coding…. This is what our Bitsbox looked like on arrival…. There are a number of subscription options for Bitsbox: Digital, Supercards, and Deluxe Bitsbox. Digital: Digital subscribers receive an email every month with a link to download a PDF of the latest Bitsbox projects, suitable for printing yourself. Each contains an ever-advancing set of awesome apps to build! Supercards: Bitsbox Supercards subscribers receive the latest Bitsbox projects in the mail every month. Each full-color, heavy-duty card set contains an ever-advancing set of awesome apps to build. Deluxe Bitsbox: Comes in 3 month subscription, 12 month subscription, or monthly subscription options. You can also do a one time purchase of a Bitsbox that is available in the Bitsbox store as well as many other Bitsbox products for the coding fan or even for at school for the teachers out there. There are probably a number of questions on Bitsbox that you may still have, so I recommend checking out the Bitsbox FAQ page to get more information about the product and how it works. What I can tell you is that my Little One loved playing around with code and changing background colors, objects, and what happened to things on the screen. Her knowing that the commands that she typed were controlling what happened on the screen for the app was very intriguing to her. Okay I could go on forever but I think you have a ton of information to take away and explore more about whether Bitsbox is right for you and your kids. We do love our Bitsbox and it is a ton of fun to play around with code and see what you can create.